There is an basic entrance exam to know about the skill level of the student. Based on the result of the exam the students will be guided for their further development. 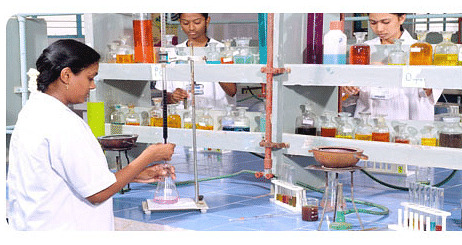 A prestigious part of the Nadar Uravinmurai Educational Trust the Nadar Saraswathi College of Arts and Science was established to offer high standard education to every student. Being one of the oldest institutions of Tamil Nadu the college is producing professionals who are dedicated to their profession. The college comforts all the students by providing them numerous facilities and with the well planned academics the management is striving to offer them a bright future. The career oriented programs, extracurricular sessions will allow them to gain a developed personality. Airport: Madurai Airport is at a distance of 91.6 kms from the college campus and one can easily reach in a hired vehicle. Railway Station: Railway Station Feeder Road is 6.8 kms far from the campus and one can reach in common local vehicles. Bus Stand: Reaching the campus in bus saves a lot of time as there is a better frequency of buses. Why to join Nadar Saraswathi College of Arts and Science, Theni? Placement cell: The College owes a special cell which takes proper care and works with complete dedication. The members of the cell arrange various interesting sessions that create awareness and encourages them in various aspects. Alumni: The alumni association always steps ahead and takes part in numerous events organized by the college. Internships: The management made internships, industrial visits and a few more impressive activities as a part of the academics. Due to this every student gains global exposure and learn a few crucial elements practically which helps them in interviews.